For The Good Times-One Of The Best Books What Ever Lived. In January 2017, whilst living in a soul-less new-build estate between Airdrie & Coatbridge, I became aware of a novel due for publication in a couple of weeks time. This Is Memorial Device, set in Airdrie, music a constant thread. The humorous tag line, It’s not easy being Iggy Pop in Airdrie sold it to me. I expected a memoir style novel probably published by a small indie. Within a minute of holding the book, those presumptions were dismissed. Firstly, it was published by Faber & Faber and then the wonderfully titled chapters, such as, Holdin Cells fur Oerweight Ballerinas and I Thought They Had Cut the Top of His Head Off and Were Spooning Out His Brains told me this was a completely different animal. It stated on the inside cover that the novel was An Hallucinated Oral History of the Post Punk Scene in Airdrie, Coatbridge and Environs 1978-1986. When I began reading the book, I couldn’t put it down. A peculiar feeling washed over me, a feeling I’d only felt a lighter version of when reading another novel from the hundreds I’ve read, Crime and Punishment by Dostoevsky. The feeling I can only describe as trance-like. Forgetting about the actual act you’re engaged in. Completely and utterly immersed. 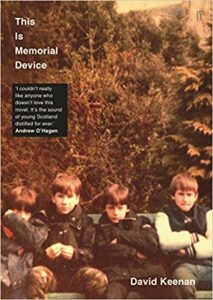 Memorial Device burst with poignancy and proper laugh out loud accounts from various characters who lived through the fictional halcyon days of post-punk in Airdrie of the 70s/80s. I shouted from the rooftops about the book and was delighted it received the plaudits it deserved. In March 2017, I attended an event featuring the author of the book, David Keenan, at the Aye Write festival in the Mitchell Library. His conversation with the host, Vic Galloway, only placed him higher in my estimations. He spoke of how he’d previously written books then destroyed them and started again. In the book, he used a word constantly mouthed in a derogatory manner during my childhood growing up in Drumchapel, PLAMF. I’d completely forgotten about the word and hadn’t heard it for over thirty years. I mentioned this to him as he was signing copies of the book and he duly signed my copy, To Martin, Who Knows What a Plamf really is!!! Memorial Device hasn’t left my bedside since reading it in January 2017. Always dipping in and out of it, re-reading the odd page or chapter. So, when I read an article confirming his next novel would be about, The Troubles, and was due for publication in January this year, I couldn’t wait to get my hands on it. Waiting on the release of, For The Good Times, felt like the pre-digital days when a favourite band were releasing a new record and I’d be up at HMV on the day of its release to secure a copy. A fortnight or so ago, I read a newspaper article where David spoke of his late father’s love of Perry Como. Not only the music, but his style and how he lived his life. How his father would sit at night with him drinking tea and eating scones whilst listening to Como. Describing it as ‘Comotherapy.’ This truly resonated with me. My father had an obsession with Sinatra. Every other singer was a ‘cabaret act’ compared to Sinatra. The only other singer he would begin to entertain was, Bobby Darin. As a child, my friends and I would be playing Three Sticks or British Bulldogs outside our house and a voice would boom from my Dad’s bedroom. My friends would say, ‘Is that your Da playing his records again.’ I’d tell them no it’s my Da singing, he’s making his tapes. He’d be in the ‘recording studio,’ a little microphone plugged into the hi-fi, recording himself singing Sinatra songs. On the tapes he wrote, ‘Tommy and Frank.’ If you made the error of chapping on the bedroom door to interrupt him you’d be met with the sight of his face inches from yours, his tongue hanging out, teeth biting down on his tongue, eyeballs popping out his head, his hand waving from side to side. Not a word spoken, then, the door slammed shut. His love for Sinatra was such that when it was announced he was performing in concert at Ibrox, he refused to go. Sinatra was in the twilight of his career and my father thought his voice was gone and attending the concert would only tarnish his memory and love of Sinatra. At my father’s funeral, the last song played was, Let Me Try Again. Relatives not seen for many years convinced themselves it was him singing and not Sinatra. The main characters in, For The Good Times, share a similar kind of love for, Perry Como. Numerous conversations about his music, sartorial elegance, love for his wife and teetotal-ness are peppered throughout the novel which tells the story of Sammy and his friends/comrades in Belfast during The Troubles. I found their love for Como a little curious. Their behaviour had me thinking they’d put Sinatra and his hell-raising ways on a pedestal, not Como. Perhaps, in Como, they looked at the man they wish they could’ve been. For The Good Times is a story about friendships, the impact the conflict had on these friendships during a time when subterfuge and paranoia was the norm. As with his previous novel, Keenan shows such talent for creating memorable characters you care about. I shed tears of laughter at times as I read conversations involving, Barney. His analysis of various topics, particularly music, was a real highlight. These little scenes in the pub or the comic shop the three friends ran made me feel like I was present. One scene, in particular, where a comrade is extolling the virtues of Hawkwind and sonic attacks is an absolute classic. Keenan’s writing forensically examines human beings and how differently they react to their conditions. In one scene, Sammy is sat in his car. He has gotten into the habit of following a female he has a grudge with, he’s asking himself why he keeps following her and comes to the conclusion it’s, ‘to keep my hatred sharp.’ It can’t have been easy to come up with something as good as Memorial Device, however, in my opinion, he has succeeded and more. Keenan’s writing is visionary. The narrator cracks Irishman jokes throughout the novel and the comic book scenes had me scratching my head like I was attempting to solve a koan. This is writing at a different level to anything else at the moment. For The Good Times, will join Memorial at my bedside, another perfect book to dip in and out of, to marvel at how good it is, until he rewards us with his next offering. 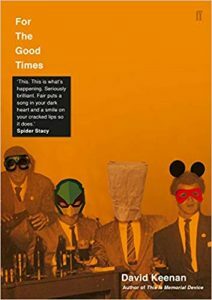 For The Good Times, is published by, Faber and Faber, and is available now. http://www.martingeraghty.co.uk/wp-content/uploads/2017/11/marton-geraghty-logo.png 0 0 Martin Geraghty http://www.martingeraghty.co.uk/wp-content/uploads/2017/11/marton-geraghty-logo.png Martin Geraghty2019-01-29 22:14:512019-01-30 10:17:41For The Good Times-One Of The Best Books What Ever Lived.